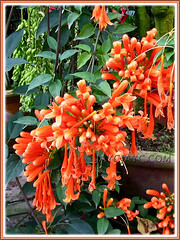 With such brilliance in its flaming orange-coloured blossoms, it’s inevitable that Pyrostegia venusta has been reputed as one of the most spectacular flowering vines in cultivation. A vigorous and rambunctious climber with tendrils, Flame Vine will produce abundant clusters of brightly coloured trumpet-shaped flowers practically all year long. Truly a traffic stopper when in full bloom, especially if the vine is draped over a large pergola, fence or espaliered on a trellis or building structures. Also known as Pyrostegia ignea, it is such a prolific bloomer – check this out at the site of UF/IFAS Okeechobee County Extension Service to enjoy some photos showing its glorious and stunning floral display. Wow! Like the other captivating vine, Thunbergia mysorensis, we were enchanted by this beautiful liana when we first saw it at the Cactus Valley in Brinchang during our vacation to Cameron Highlands years ago. Etymology: The genus name Pyrostegia comes from the Greek where ‘pyro’ means flame which is descriptive of its fiery reddish-orange flowers and ‘stege’ means covering, describing its growth habit. The species name ‘venusta’ means pleasing. 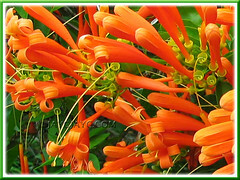 Features: Pyrostegia venusta is one of the most striking species of the genus Pyrostegia. A fast growing and vigorous tropical liana or woody vine that can reach 24m long if unchecked, covering very quickly with its tendrils and by twining whatever support it’s clung to with its rampant growth. Often times smothering the large trees or palms that provided support, Flame Vine has been listed as potentially invasive in some regions as it can easily regrow from its roots even if damaged above ground. Hardy and evergreen in the tropics, it bears medium to dark green foliage, having compound leaves with 2 or 3 ovate leaflets, 4-11cm long and the terminal third leaflet often a 3-parted tendril. They’re arranged in pairs, opposite each other on the woody and slender stems and sprawling branches. 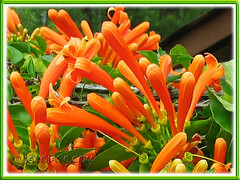 Orange Trumpet Creeper is a floriferous climber that flowers almost continuously throughout the year in the tropics, and in the subtropics from late fall to spring, even lightly during summer. The long-lasting, brilliantly coloured and attractive flowers are a magnet for hummingbirds, bumble bees and butterflies too! 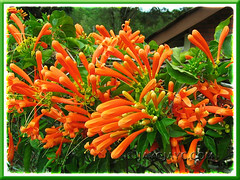 The 5-7cm long tubular flowers, stunningly ablaze in reddish-orange are borne in clusters of 15-20 in a leafy terminal panicle or on short lateral branches. Its tubular corolla of fused petals has 4-5 reflexed lobes at the opening, with the long yellowish-orange stamens and style extending beyond the tube. The familiar shape and colour of its fabulous blossoms remind us of the quasi-vine, Tecoma capensis (Cape Honeysuckle) in the same Bignoniaceae family. Fruit is a narrow cylindrical capsule about 25-30cm long, containing many winged seeds that can be used for propagation. Culture (Care): Pyrostegia venusta is a low-maintenance vine, but like all vining plants, pruning is something it cannot do without! Light: Prefers full sun to light shade. Tolerates partial shade but grows and blooms best with good sunlight. Moisture: Medium water needs. Though highly drought tolerant when established, good to water regularly especially during hot and dry seasons. Soil: Moderately fertile, light and moist, but well-drained soil. It tolerates many kind of soils: acidic, alkaline, clayey, sandy or loamy. Others: Hard prune after flowering to encourage branching and promote more flowers, as well as to restrain huge and unruly size. It’s hardy and can tolerate severe prune if needed. Benefits from fortnightly or monthly feed with a flowering fertilizer though it require minimal feeding. Generally, pest and disease free but do watch out occasionally for scales, caterpillars and mites. For subtropical regions: Hardiness: USDA Zone 9-11. Blooms sporadically all year long but perform best from late fall through winter but not in freezing regions. Shelter from cold winds and frost that may ruin young flowers and plant. Propagation: Easily propagated vegetatively from semi-hard cuttings, suckers or layering. Also, by seed germination. 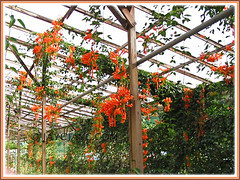 Usage: As a spectacular ornamental vine, Flame Vine is excellent for landscaping and to cover and decorate garden fences, trellises, arbors and arches and walls. Train them high if possible for the dramatic and spectacular floral display. For subtropical and frost-free regions, grow it to bring sunshine to your winter garden as it blooms best in winter when most others are sleeping. Grow it as an attractant for hummingbirds and other pollinators if you’re a nature lover. 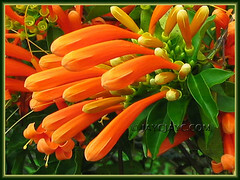 Pyrostegia venusta is used in traditional Brazilian medicine as a general tonic for treating diarrhea, vitiligo, cough, and common diseases of the respiratory system related to infections, such as bronchitis, flu and cold (ref. : NCBI, US PubMed). Sorry, no clue where you can buy the plant.